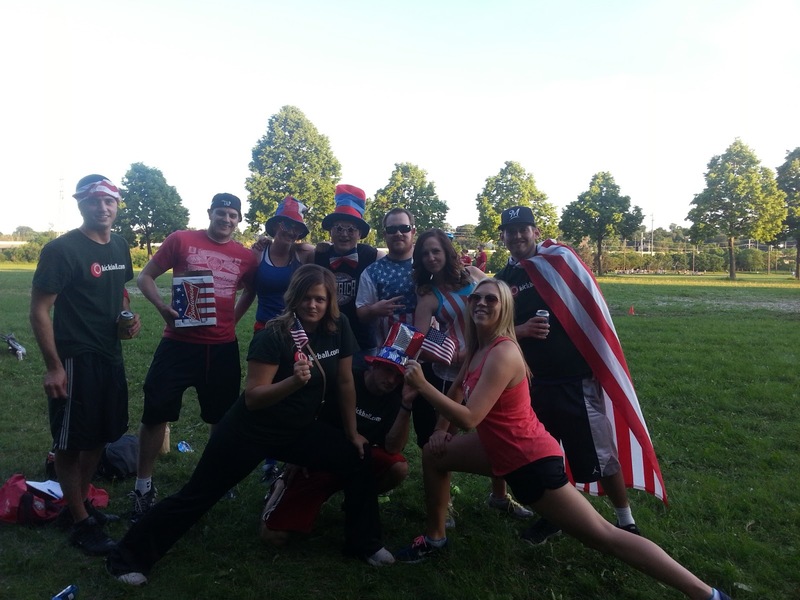 Bryn Mawr, MN - The late game showdown on ’Merica Day at the kickball yard featured Booze on First vs. the red hot Ball so Hard squad. Following a quick victory in rock paper scissors to start the night off, Ball so Hard took the field as the home team. ‘E’ Ehnerd took the mound in his first start of the short season, and turned in a spectacular performance. Both teams remained scoreless through four quick innings, featuring just one kick for a kick by Halaina in the bottom of the third. Ball so Hard broke the tie in the bottom of the fifth with three straight singles by Ehnerd, Stark, and Milk-in and a sac fly by Abby. This is the only ‘point’ they would score in the big inning. ‘E’ continued to pitch the shut out through nine innings back by some solid D by Cory J., Adam, Jason, Carlos, Abby, Cait A., and Halaina. Booze on First finally pushed someone to first in the top of the tenth and ended up pushing two runs across to take their first lead of the contest at 2-1. Ball so Hard stepped up in the bottom half of the inning down by one with a grin. A lead off single by Abby, followed by singles from Ali, and Haliana loaded the bases with Ball so Harders. A strong attempt at a sac fly by co-captain, Cait A. led to a play at the plate, which turn out not in Ball so Hards favor posted the first out of the inning. A quick kick by Lauren H. led to the second out of the inning, stranding three on the bags with two outs and the team down by two ‘points’. Adam G. stepped up with nothing but U.S.A. on the mind and kicked a sharp liner to shortstop which led to an attempted throw to third that went array and pushed across the two runs needed for Ball so Hard’s first walk off win of the 2013 season. Ball so Hard awards of the week go to Erin for the ten inning pitching performance and one run scored, Kanuit for a pair of singles and a run scored, Halaina for going three for three and a run scored, Carlos for a pair of singles and strong defensive effort, and Adam for a pair of singles including the game winner in the bottom of the tenth. Ball so Hard will take on Kick This @ 6:30 p.m. on Field One in the final regular season match of the year on Thursday, June 20.